Gotham City's resident cat burglar has arrived. 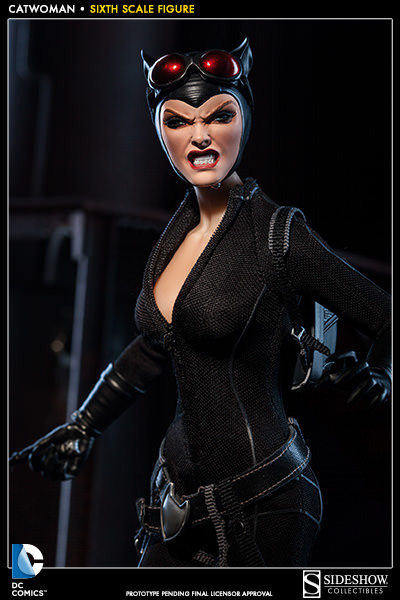 Sideshow Collectibles is proud to introduce the elusive and alluring Catwoman. 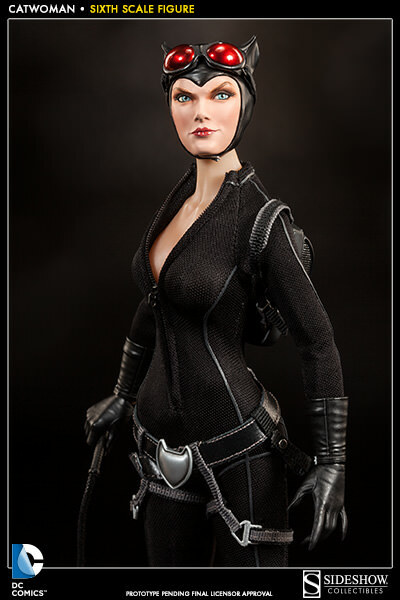 Fitted with a sleek black bodysuit and a few key tools of her trade, Selina Kyle is more than ready for her next heist. A helpful climbing harness will come in handy when making a quiet entrance or a hasty exit, and her trademark whip keeps the boys in line. A girl can't leave home without the right accessories, so we've included a cat-shaped belt buckle, infrared goggles, burglary friendly boots and of course, this cat has claws! Two hand-painted portraits purr-fect our feline femme fatale, one with Selina's mischievous smirk, the second shows off her more ferocious side. Gentlemen of Gotham City, keep a tight grip on your fortune and your heart.